North Sea House, Whitby, North Yorkshire. Rear perspective view. Zinc Clad box on stone plinth with timber panelling. 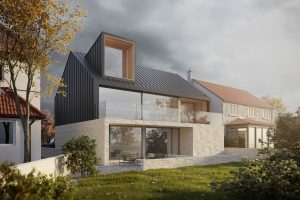 Architectural project by Ian Hazard Architect.